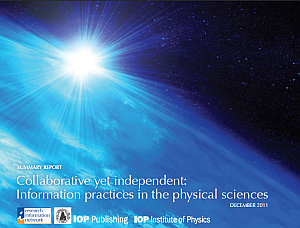 The Research Information Network (RIN), the Institute of Physics (IOP), Institute of Physics Publishing (IOPP) and the Royal Astronomical Society (RAS) in the UK have just commissioned a report that examines information practices in the physical sciences. It follows the previous case studies in the life sciences and the humanities. This report uses seven case studies (particle physics, astrophysics gamma ray burst, nuclear physics, chemistry, earth science, nanoscience and users of the zooniverse platform) to understand how researchers in the physical sciences find, access, use and share information. The study suggests that new technologies are widening access to information and making computation faster. But their effects upon researcher practice are more subtile, and there are interesting tensions between new behaviours and existing infrastructure. While the physical sciences rely heavily on collaboration, the individual scientist and individual fields remain very important. Within collaborations and within research fields, there is often broad agreement about the important questions to be pursued, and researchers make considerable shared efforts to pursue them. However, individual choices and efforts are still important in terms of information use and career progression. Even within collaborations there is considerable variation in individual choices, and most scientists are still judged independently of one another. The report suggests that librarians, publishers, learned societies, research funders and other stakeholders within the scholarly communications system must recognise the differences between disciplines, and understand why researchers engage with tools and technologies, in order to supply them with the services and skills that they need. For all our readers that are working in the field of physical sciences or just beeing interested in information practises in the natural sciences it is worth reading – you’ll find the summary of the report here, and the full report here.